Bushwalk Australia • View topic - Water on the Gold Coast Great walk. Doing the Gold Coast Great Walk in May, and I was wonder if anyone can tell me about the availability of water on the trail. Map has two tap icons on day one and day two. Are these reliable? Also I would assume there is water at Binna Burra. I see from the map there is no water at Woonoogoora camp. Is there any creeks in the areas that one can get water from? Obviously it will need to be treated. As I said it will be May. So it will be cooling down by then. But the availability of water is still a necessity. Re: Water on the Gold Coast Great walk. I haven't done the walk but looking at the maps, your beside or crossing creeks as you go anyway. In Numinbah itself you should be able to grab some water before heading off into the bush towards the walkers camp. Plus your crossing creeks in that area too. Apple Tree Park in Springbrook plateau has water. I'll be over that way in the next week or so I'll check out the water situation then...unless someone else who's actually done those sections adds to the topic between now & then. ofuros wrote: I haven't done the walk but looking at the maps, your beside or crossing creeks as you go anyway. There should be a few water points on the Border Track, although most of them will be close to the escarpment. This shouldn't be an issue as you will be able to fill up after an hour or two of walking, depending on how quick you're moving and how wet it's been. After lots of rain you may get water closer to the start/end of the Border Track. Dragoon Bird Creek near the Coomera Falls Circuit turnoff usually has pretty good flow (about 2/3 of the way to Binna Burra). From memory there are also a few creeks that cross the track about mid-way between Binna Burra and O'Reilly's. In the unlikely event that you can't source water elsewhere, you could take a short detour north along the Toolona Creek Circuit (but this wouldn't be necessary unless things have been quite dry). EDIT: on day 2, it's definitely worthwhile making a short side-trip to lower Ballanjui Falls, the Nixon Creek area is lovely (in fact, if you're new to the area I would highly recommend doing the full Ships Stern Circuit as a day trip from Binna Burra on the way through). If you're feeling fit, you can also do part of either Coomera Falls Circuit or Toolona Falls Circuit during day 1 rather than just sticking to the Border Track (but avoid these options after very heavy rain). Champion_Munch wrote: EDIT: on day 2, it's definitely worthwhile making a short side-trip to lower Ballanjui Falls, the Nixon Creek area is lovely (in fact, if you're new to the area I would highly recommend doing the full Ships Stern Circuit as a day trip from Binna Burra on the way through). If you're feeling fit, you can also do part of either Coomera Falls Circuit or Toolona Falls Circuit during day 1 rather than just sticking to the Border Track (but avoid these options after very heavy rain). Thanks for the tips. Ive actually spent the weekend at Binna Burra and did the whole ships stern walk . As well as a couple of smaller ones. We`ll be starting from the O`Reilly`s end and ending in Springbrook. My main concern really was for day 2. Binna Burra to Woonoongoora camp. But I guess there is Numinbah shop. Nerang river itself, if your desperate. Toilets(boil) next to school of arts has water. Waterfall creek & the creek(boil) before the climb up to Woonoongoora Camp are flowing well. Camp tank has water, around 3/4 full. Lipstick red Native Raspberry's were ripe for the picking...not a lot of taste but they were juicy, and there's a Lime tree at the camp area. Up to Apple tree & back down again to Numinbah by 10.30am before the heat kicked in...the zig zags or the 900steps will give your thighs a good workout. Nixon creek is gurgling away nicely. Ticks before the storm blew through...leechfest during & after. Steep track sections down to Nixons ck are extremely slippery after heavy rain, expect to too loose your legs & fall on your pack...and then slide slowly down the slope. Fiery red flame trees are flowering, native raspberries are ripe, too early for a passionfruit vine l spotted & tad early for the local limes. The roadside stall just before the Numinbah cafe has beautiful scented floral honey for sale...large jar & small bottles available. The public toilets beside the Numinbah School of Arts are fenced off & closed by at the moment...a tree branch has damage the roofing around the back. If you walk 50m past the School of Arts hall you'll come to a small forest reserve on the left hand side, just past the orange deer sign. Jesus, GC hinterland is an oasis! There is water anywhere you go. 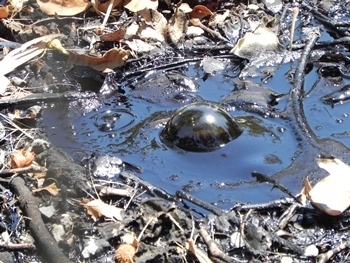 Try Sundown and you'll be begging to drink that nice looking tar water. Mt Donaldson + McAllister's Creek. gbagua wrote: Jesus, GC hinterland is an oasis! There is water anywhere you go.